Once the dynamic pricing addon is activated, head over to the event edit page on the wp-admin where you want to add dynamic pricing options. 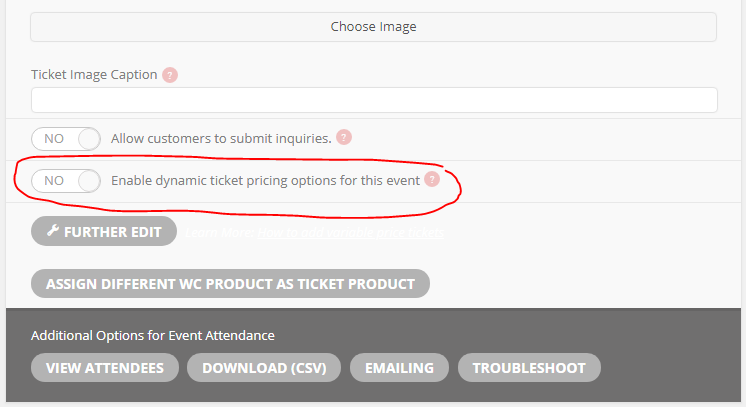 In this event edit page under Tickets settings towards the bottom of that meta box you will will a new option that will allow you to enable dynamic pricing for this event. Important: At the moment only simple Event tickets are supported with dynamic pricing. Variable tickets are NOT supported. Once enabled you will see new options that comes with the dynamic pricing addon. This option worked with dynamic pricing options once set. And enabling this will make the regular price as strikedthrough price when dynamic pricing values are honored. Here you can set a default special price for simple ticket, that will be used if the customer is a loggedin member as oppose to a new customer. In this part of the settings you can activate Event ticket pricing that is altered based on time. Eg. different more expensive price for ticket when it is 1 hour before event starts. 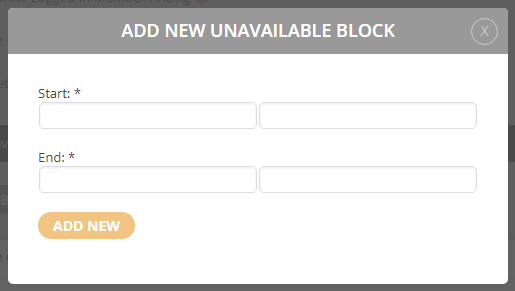 Add new pricing block button will open a lightbox form where you can set the pricing during this time and the start and end time and date for the duration. This lightbox will also show the event start and end times to guide you figure out the dynamic pricing time range. 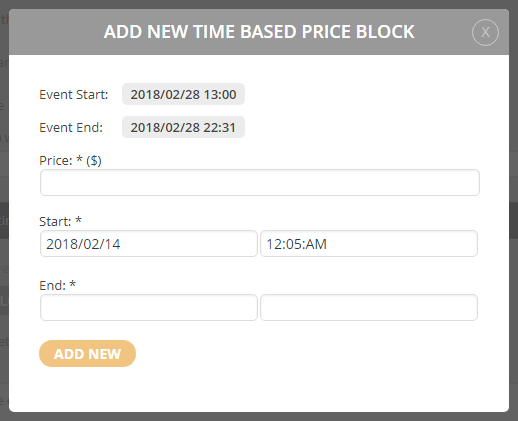 This will allow you to create time ranges just like above method, but in this case, the time range you create will be what is used to make the ticket unavailable for sale. Add new unavailable time block button will open a lightbox where you can set the start and end time and date during which the event tickets will NOT be available for sale.